Here we are, at last. I know quite a few people have already played and reviewed this game. Some are even playing it again. I actually went back to the original game to start a new playthrough to span both games, and while I know there will be some repetition in dialog and encounters, the story’s solid enough to withstand repeated playthroughs. That’s more than you can say for a lot of games out there today. But I’m getting ahead of myself. Mass Effect 2 opens with a shocking curbstomp battle between Commander Shepard’s intrepid vessel, the Normandy, and a mysterious attacker that can see the plucky ship despite its stealth systems and blasts through its defense systems like they weren’t there. Shepard manages to get his crew to safety before he’s blown out to space and dies. The pro-human semi-terrorist “by-any-means-necessary” organization Cerberus scrapes Shepard off of the nearby planet’s surface and spends two years resurrecting him. The Reapers, extragalactic Big Bads introduced in the first Mass Effect, are still a major threat despite the government’s denial of their existence. 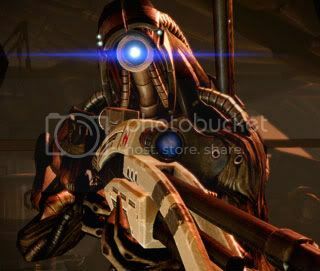 They’re not helping humanity in the disappearance of their colonies, either, so Cerberus turns to the reconstructed Shepard to undertake a suicide mission through an unexplored mass relay to uncover the source of the abductions and send back more information on the Reapers. Because who better to send on a mission where everybody’s likely to die than someone who’s been dead already? We got this instead of a vehicle. I hope you’re all happy. Wait. Shepard dies? He wasn’t in a coma or suspended animation and presumed dead by the galaxy at large? I found that to be a little far-fetched. Sure, technology in the future depicted by Mass Effect is pretty advanced, and being rebuilt by Cerberus explains why you can implement so many cybernetic upgrades to Shepard as the game goes on, but the whole resurrection angle pushes the limits of believability. Shepard doesn’t really seem that bothered by it, either – there’s no crisis of faith or any real rumination on what thoughts are evoked by the experience of coming back from the dead. Even the more spiritual team members don’t think to ask, which would have been a good opportunity for the player to do a little role-playing in choosing to start a deep theological conversation, or give a Renegade-oriented “None of your damn business” response. Oh, and the story problems don’t end there. We do learn more about the Reapers, as to what motivates them and why they do what they do, but it still doesn’t explain why it wasn’t explained to us previously. Did Sovereign go for a stream of verbal crap in the style of Matrix: Reloaded‘s Architect just to mess with human heads, or was it embarrassed that the motivations of its supremely powerful machine-race were so basic and organic-like that it needed an extra layer of obfuscation? Or had the writers not figured it out yet themselves at that point? Maybe they had but they wanted to keep us guessing. Don’t get me wrong, the writing in this game isn’t bad, not by a long shot. More on that later. Some of the complaints about the Mako sections of the first game were their length and tedium. Scanning in the sequel takes just as long and… is just as tedious. Another Mako complaint is, obviously, it’s handling. So if scanning is meant to be an improvement over the Mako, the controls should handle smoothly and be a delightful diversion from ducking for cover like we’re playing Gears of War, right? Sorry, that’s not the case here. 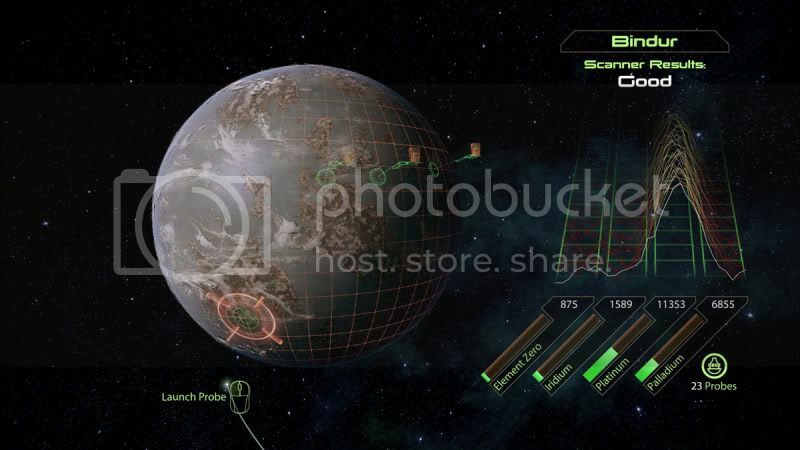 The reticle moves slowly over the surface of a world when you’re scanning, and unless you want to risk missing a particularly rich pocket of Element Zero, you need to drag it across every square mile of the planet’s surface. Now one thing the scanning mini-game does well is convey the feeling that one is in space. And I don’t mean it hearkens to Star Trek or Battlestar Galactica. No, it hearkens more to 2001: A Space Odyssey or video recordings of NASA operations. That is to say that it’s lengthy, quiet, procedural and really rather dull. Let’s move on to better news. The other major complaint about the first Mass Effect was the inventory system, which stuffed your interstellar backpack with a plethora of ultimately useless junk that you then needed to sell one at a time to the nearest vendor. BioWare tossed that stuff into the Mako when they shoved it out the airlock, and the system of managing equipment in the sequel is extremely streamlined. Rather than switching weapons, you upgrade the models available to your team members. While these upgrades must be purchased with resources gathered by the aforementioned scanning malarkey, you won’t be thinking about that tedious stuff as your new Normandy takes you from one gunfight to the next. Speaking of fights, the combat system in Mass Effect 2 is also somewhat streamlined. You can map more powers for easy use, you don’t have quite as many to manage, squad commands are broken a bit more easily and fights are bit faster-paced. 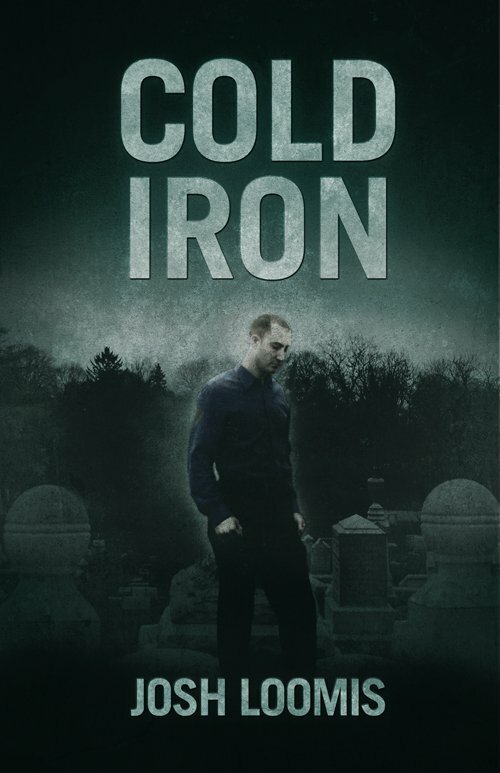 The measures of protection on your foes, as well as their scale, can vary from encounter to encounter which can lead to breaking up the monotony of the cover-based shooting. The multiple map buttons mean you can address a particular enemy’s defensive measure at a moment’s notice, provided you don’t just pound them into submission with a stream of mass-accelerated death or your favorite physics-altering biotic ability. Like the previous game, this one is rendered very well, with the environments and technology providing a great sense of immersion. 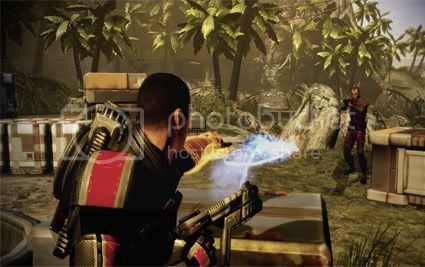 The voice-acting, for the most part, also draws the player into the experience, as they travel from one exotic locale to the next to recruit members for Shepard’s suicide mission. And being able to customize your armor’s look was a nice touch, along with the fish tank & Space Hamster you could add to your cabin on the Normandy. BioWare might be a little shaky in the story department, but one of their strengths is their characters. Mass Effect 2 gives us a diverse, interesting and well-written cast, from the penitent and quiet assassin Thane to Subject Zero, who uses aggression and profanity to conceal a deeply wounded soul. The conversations Shepard has with these individuals give the game a surprising amount of depth for what could easily have been a Gears of War clone with a few RPG elements. While this might come as no surprise to long-time fans of BioWare’s games, the purchase of the company by EA could have caused some concern. However, as much as EA might mess with other aspects of a game – DLC or DMA or some other acronyms – it appears they’re leaving the story alone, and thank the Enkindlers for that. Being able to import your Shepard from the first game gives the experience a fantastic sense of cohesion and immersion as well. It’s surprising the amount of continuity exists between the two games, from the outcome of major events to minor encounters you frankly might have forgotten about in the intervening years. Returning characters are a welcome sight, even when they’re hated foes and especially when they’re beloved party members. There’s a real sense that time has passed since the end of the first game, and every life you touched then, even in passing, has been changed because of your influence for better or for worse. The last thing that really made this game enjoyable for me was the changes to the conversation system. It’s been said that quick-time events should be an integral part of gameplay and not thrown in arbitrarily. The Paragon/Renegade interrupts are not mandatory for you to finish a conversation, but setting one off not only flows well with the conversation but often yields pretty spectacular results. On top of that, conversations in general flow more naturally, with characters moving as they speak, camera angles changing dynamically during conversations and subjects reaching far beyond the usual “What did you think of the last mission?” or “Do you think I look cute in this armor?” fare. I’m Commander Myth and this is my favorite review on this site! Who was your favorite character? I loved Legion and Garrus! I was really happy to see what happened with both Garrus and Tali. Of the new crew, Legion, Thane and Samara are the standouts for me. Grunt, as well, but only because I got to hang out with Wrex more thanks to his loyalty quest. I’ll tell you what I /didn’t/ like: That punk move pulled by Kaiden (or depending on how you played ME1, Ashley) on Horizon, and then the “apology” email I got afterward. Josh: Every time I was with Grunt I wanted to be with Wrex. Grunt was interesting at first but his abilities weren’t all that conducive to how I play the game and I kept having to resurrect him. My only complaint about Legion is I never got to the end of his dialogue options so I never found out why he emulated Shepherd! I’ll have to wait for my second play through. @John–I’m assuming you didn’t sleep with him, then? If not, then that’s probably why you never received an apology note. In turn, I didn’t get the explanation from Liara about how Cerberus found me in the first place (though my husband, also named John, did) as I was not romantically involved with her. Grunt. . .not bad, but not my favorite. Legion? They had BETTER give him more screen time in the next game, or I might start a one-woman revolt against BioWare. Hell, throw me some good Legion-related DLC, and I’ll be happy. Just sayin’. 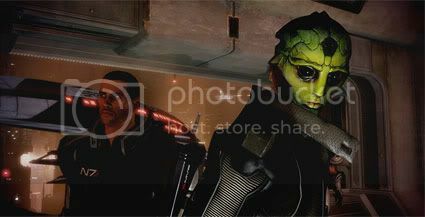 @Everyone–Is anyone else hoping the Asari bartender on Illium turns out to be Liara’s “dad?” Seriously? That would be WONDERFUL. Even if that doesn’t happen, I liked her a whole damn lot. First time through ME1 I played as male shephard, then I switch over to female Shepherd. For my first time through ME2 I was female then male. I was really sad when Tali died in my ending. 🙁 after all my hard work she died and it was a shame. Were all of your party members “loyal” when you headed in to endgame?